I’ve adopted a house style over the last couple of years when it comes to dancing shots in that I like to drag the shutter when deploying a dab of flash. It’s usually, winter portraits allowing, the only time I connect a flash by lead to my camera body, preferring an available light approach for the rest of the wedding. For couples reading this, I should elaborate on the shutter drag concept. In essence it means to slow down the shutter to a speed where movement would be one long blur, certainly in terms of capturing dance movement. For me, that’s 1/13, or 1/15. Next up I select a flash power that doesn’t nuke the subjects before me, but works in such a way as to freeze the action at an important given moment as I depress the shutter. Finally, and this is for all anglers out there, I whip the camera right, left, down or up, just slightly as I activate the shutter – and this is what creates medium to long light trails. If you want to see an example of this, then zip through to this link here for one. But this post is about laying down the flash and engaging the scene with available light, setting the ISO as high as you can feasibly stand with regard digital noise (or grain as it’s artistically interpreted) and recording the real colours of a dance-floor. 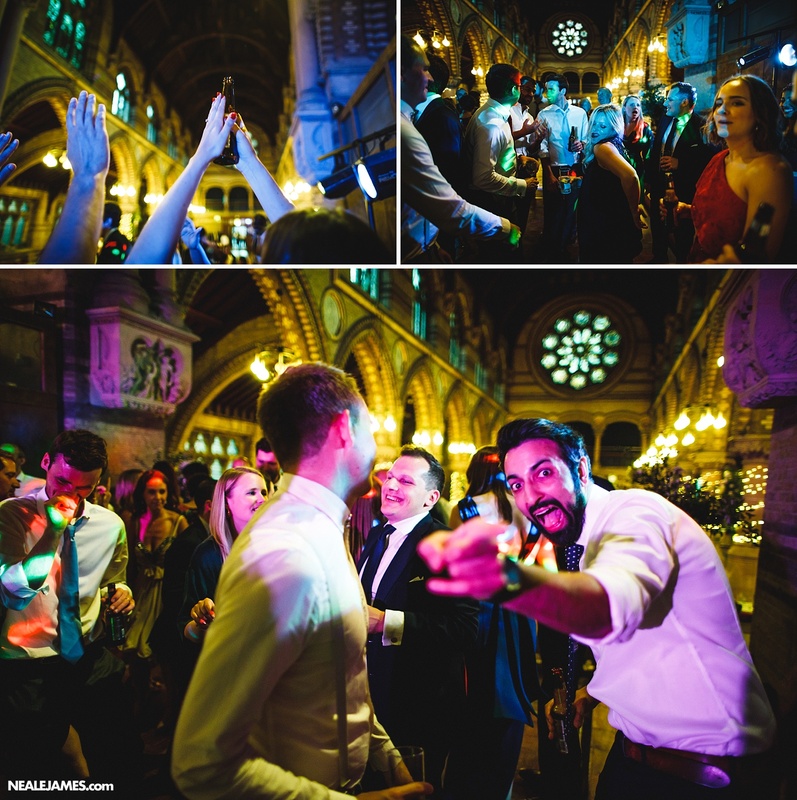 The reality of this photographic colourful approach is what your couple will remember, so as a bed partner to your flash work, this is a good way to document the evening’s entertainment. As a caveat, this does work well when the entertainment has provided reasonable stage or dance floor light to illuminate the action beyond a band. Sadly this isn’t often the case. A flood of red, green, blue, even lurid pink, it all goes to provide this mood board of movement. This is a time to seek that perfect exposure for sure, but not to expect it. Light flood isn’t exactly subtle, but the results can be super atmospheric.